The father of Manuel Godoy believes Real Madrid tried to hide their involvement with his son during FIFA’s investigation into the club. Madrid, along with city rivals Atletico, were last week banned from registering players during the summer 2016 and winter 2017 windows for breaking youth transfer rules, although the La Liga clubs have denied any wrongdoing and say they will appeal. When Barcelona were first punished for breaking the same rules, it was widely reported in Spain that Madrid might face a similar problem. Back in April 2014, Marca pointed out that Venezuela youth international Godoy was one of a number of foreign-born youngsters involved in the youth setup. But 12 months ago some reports claimed that Godoy had never actually officially signed with Los Blancos, as FIFA had not ratified the deal. AS also said at the time that Madrid planned to meet with the parents of the player, who first came to the club’s attention in 2012 when he was just 12 years old. 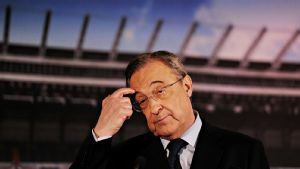 His parents, Ramon Godoy and Gladys Torralba, appeared on Radio 4G “A la Contra” on Monday night, and said that once the potential problem with FIFA arose, Madrid broke off all contact. “We never signed any official document,” Godoy Sr. said. “They did send a letter telling him he had to join up for the season. [Then] one Monday they told the kid that he could not train. They told us FIFA were investigating. The Godoy family were already living in the Spanish capital before the talented youngster first played for Madrid — where his success was such that he had even received personal congratulations from club president Florentino Perez, it was claimed. “When Manuel did his trial with Real Madrid we were already living in Madrid a few months before,” Godoy said. “Real Madrid chose Manuel and they sent him the form, and more, he played some tournaments and won an international tournament in Rimini. Godoy Jr. is currently not playing any competitive games while training at the Madrid-based academy run by well known scout and youth coach Miguel Coira.